On Sol 2 of NASA’s Mars Science Laboratory mission, we’re certainly not short of new things to look at. 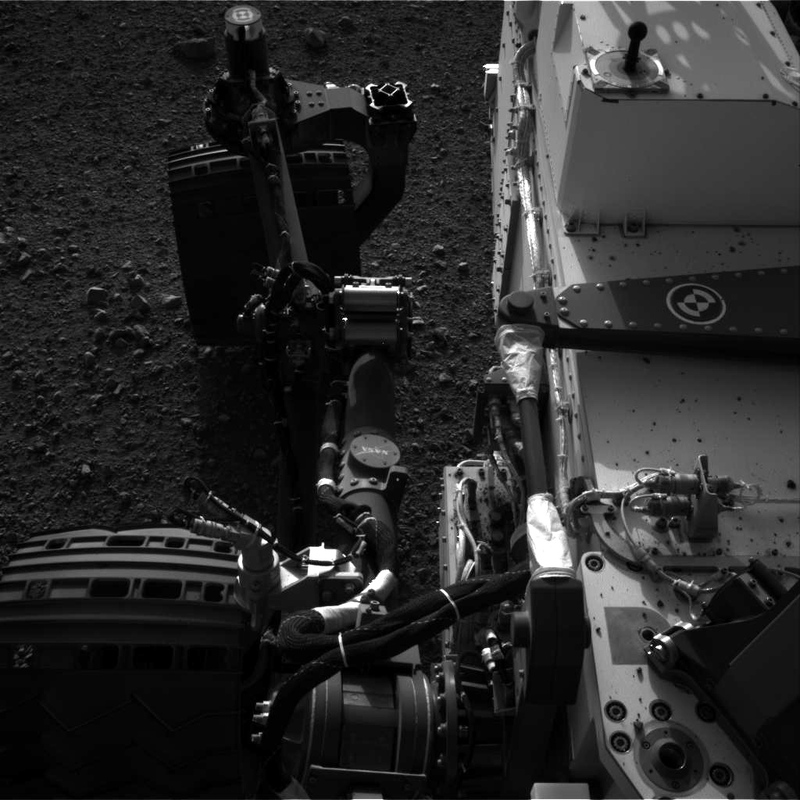 Early on Wednesday, the JPL team released images from the rover’s raised mast. Atop the mast is the blocky ChemCam laser, two Mastcams and four Navcams — a collection of equipment that is colloquially referred to as the rover’s “head.” As soon as the mast was deployed, mission controllers switched on the Navcams and commanded Curiosity to look around its new home. First up was the striking image of the shadow of Curiosity’s “head,” then came the wonderful “Mojave Desert” view across Gale Crater to its rim. 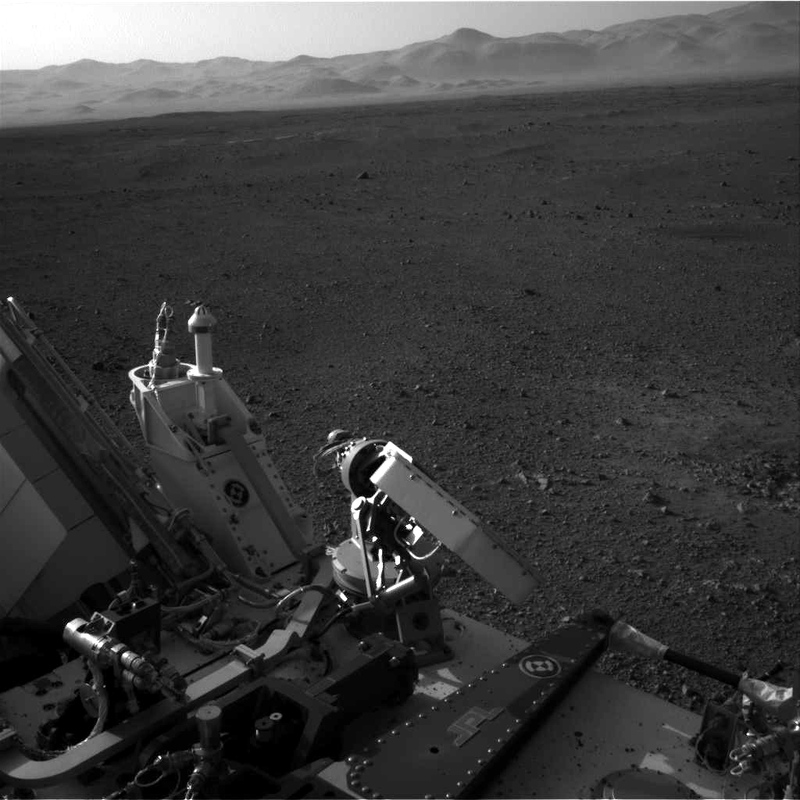 Now, in a new flood of hi-res imagery tonight, images of Curiosity’s deck have been released. Interestingly, there’s some debris strewn over the horizontal surface, indicating the one-ton rover’s landing kicked up a lot more than just dust. During Curiosity’s descent and landing on Sunday night, the famous Sky Crane maneuver was used to lower the rover to the surface. In doing so, the rockets attached to the platform blew away the surface layers of regolith and small rocks, exposing what appears to be bedrock. The craters generated by the rocket thrust is clearly seen in a couple of Navcam images. Although dust was bound to be thrown into the air, inevitably settling on the rover, small rocks also appear to have been blasted onto the rover’s deck. The largest rock pieces appear to be no bigger than the size of a dime — when comparing them with the dimensions of the Radiation Assessment Detector (RAD) instrument (in the top left of both frames in the image above). The RAD’s circular “window” is roughly the size of a coaster. Could the small rocks cause issues with the operation of instrumentation mounted on the rover’s deck? Were they expected to be blown from the ground onto the deck? It will be interesting to hear what will be discussed by the MSL team during Thursday’s 10 a.m. PDT press briefing. All raw images were grabbed from the NASA JPL mission site. It must have been such a strong crash for some debris to find their way up onto the deck of Curiosity. Whoever named the rover named it aptly. A lot of people are curious about its flight and its continued journey on Mars. I would be one of the millions of people who would tune myself into reading and listening about what is happening to the rover that has become the strongest proofs of humanity’s brilliance when it comes to exploring the space around them. no debris whatsoever on the wheels ? Next Next post: Sol 3: Beautiful, Beautiful Mars Dirt. In Color.